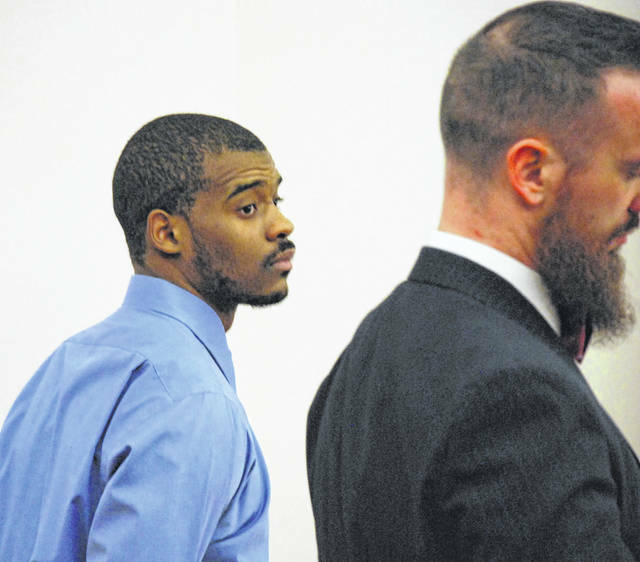 A mistrial was declared Tuesday in the jury trial of Jarvis Killingsworth, 22, of Chicago, who was charged in Allen County Common Pleas Court with robbing a Lima apartment manager and his wife at gunpoint earlier this year. He is pictured with his attorney, Carroll Creighton. LIMA — Jurors in the robbery and kidnapping trial of a Chicago man deliberated more than four hours over parts of two days before determining Tuesday morning they were hopelessly deadlocked. Allen County Common Pleas Court Judge Terri Kohlrieser declared a mistrial after the jury of 10 women and two men was unable to reach a verdict. The judge set a new trial date of May 2 for Jarvis Killingsworth, who faces three felony charges for allegedly robbing a Lima man and his wife at gunpoint in January. Killingsworth was indicted by a grand jury in March on a single count of robbery, a second-degree felony. The indictment was amended earlier this month to include two counts of kidnapping, also second-degree felonies. The defendant, who maintained his innocence throughout the case, took the stand in his own defense Monday and told jurors his arrest was the result of a case of mistaken identify. Apparently at least one juror was convinced. According to court documents and testimony during the trial’s opening day on Monday, on Jan. 20 officers were called to an apartment complex at 1325 W. Market St. in Lima in reference to an armed robbery. The alleged victim, Daniel Kelley, was reportedly robbed in the parking lot at that address by a black male with a gun, who demanded Kelley turn over his wallet and cell phone. His wife, Jessica, was also held at gunpoint and her life was threatened by the robber, Daniel Kelley testified in court. After an Allen County Sheriff’s Office patrol car happened upon the scene of the robbery, deputies reportedly tracked the suspect to a residence at 131 S. Rosedale Ave. While police were inside the residence, a man later identified as Killingsworth jumped from a second-story window and was taken into custody without incident. Officers found Kelley’s wallet in the suspect’s pocket, according to court documents. https://www.limaohio.com/wp-content/uploads/sites/54/2019/04/web1_Killingsworth-mistrial.jpgA mistrial was declared Tuesday in the jury trial of Jarvis Killingsworth, 22, of Chicago, who was charged in Allen County Common Pleas Court with robbing a Lima apartment manager and his wife at gunpoint earlier this year. He is pictured with his attorney, Carroll Creighton.